Yangyang International is an airport looking for a reason to exist. Built on South Korea’s east coast just seven years ago, you won’t find any delays or long queues here. In fact, you won’t find any passengers at all. The initial vision could not have been more different. Up to three million people a year were meant to throng the gleaming floors of the departure and arrival halls, built at a cost of almost $400m (£260m). But last year an average of just 26 passengers a day came through the doors, vastly outnumbered by the 146 airport staff on hand to serve them. 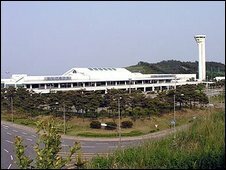 In November the last commercial flight took off, and the terminal became what the Korean national press has dubbed a “ghost airport”, an impressive monument to overestimated demand. The novel that I’m working on this summer basically starts in an airport like this one… I’m trying to think just what the fascination is, for me or in general, with this sort of space. Asia, in my limited experience, is full to the brim with things like this – empty airports built to serve as-yet-non-existent populations, high-volume roadways built for the traffic and trade of 2030 rather than 1958. Americans on the other hand make do with the opposite – infrastructural elements always seem to be handling triple the load they were intended to handle and living on thirty-years past their projected obsolescence horizon. If an airport is under-crowded in the US, this is generally because the city to which it is attached is in the process of dying. We might even say that the Asian ghost airport is the geopolitical inversion of that utterly common American form – the ruin formed by the triple processes of state defunding, creative destruction and geographical dislocation. So, while the Korean airport discussed in the BBC piece seems to have been born of political corruption – and even America has its own cases of that sort of thing – there’s still something to this I think. While it’s not at all hard to drive around the US finding the architectural materialization of private-sector speculations and public-sector dereliction, things like empty bullet-trains to unbuilt cities, hulking universities for student populations not yet born, hospitals for patients not yet sick, and slick public housing for populations yet to arrive but who vividly anticipated are very difficult to imagine in anything other than the light of the utopian apparitions. Those of us familiar with the post-industrial portions of the USA, the northeast and the Great Lakes region, know only the bent tracks and silted canals and abandoned silos and factories – the native flora cast in concrete and iron of unemployment, casualization, and privatization.